John Reed vs Sany Weill. It is not always the better guy who wins. More than ten years ago the better man lost: John Reed. How could this had happened? Well just like John Mack vs Phil Purcell at Morgan Stanley, the better man lost too. How so? Both Johns trusted the wrong guy and got played out by the shenanigan of the other party. In the extreme that was how the legendary Sun Pin the grandson of Sun Zi suffered at the hands of Pang Juan. Because ambitious self centered empire builders won, the global financial system had suffered, but as they say, it is all history now. We are all mired in trouble. Break up these banking behemoths. Whatever good they might bring us is cancelled by their liabilities. Looks like they have inadvertently raise the status of their pastor Khong Hee to quite close to Jesus Christ. What would they do next? How can a law court judge preside over someone so great and amazing? At this rate he will eventually become that special brother of Jesus Christ like in the Taiping Rebellion. Whatever happened to living the life such that people see Jesus Christ in you rather than being the great you? These youngsters have done their pastor a grave disservice, but how did they learn to become like this? My friend from Philadelphia just sent me this for my daughters :-) I am just being opportunistic and convenient to put this YouTube clip against the one for exalting Khong Hee. These young City Harvesters saw Khong Hee instead of Christ but I bet when questioned would push Christ to the fore. How convenient. We outside their church aren't deceived. 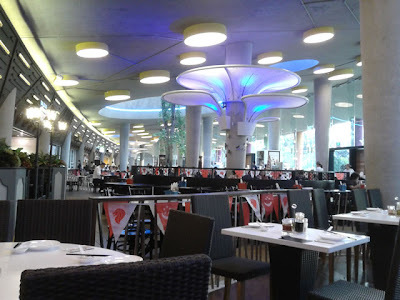 Second time we are having dinner at Peach Garden @ Gardens by the Bay. Odd to me that there should be buntings inside the restaurants. Well the whole place is built and owned by the government in the guise of NParks. The weather was too hot for a walk in the park. It was nice to see RJC (I think) pushing many disabled people on wheelchairs around. Allianz was holding a function there. I think NParks is going to earn good fees renting facilities to the financial businesses near by. 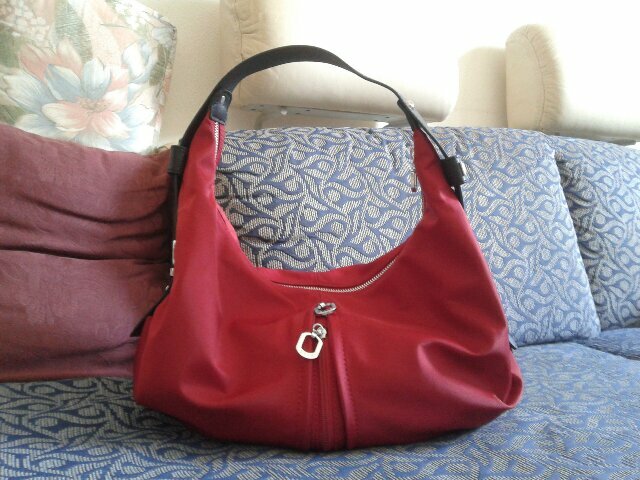 Wifey's new handbag picked by me as was the one before too. I think it will go very well with the many black suits and dresses in her wardrobe. Will there be a LV sometime? I don't know, but every senior staff including her subordinate carry LVs. 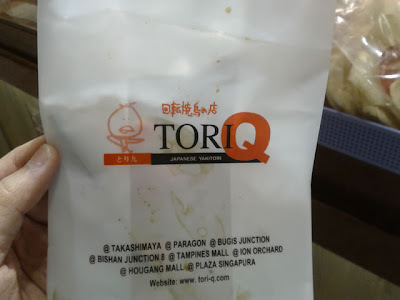 I haven't tasted Tori Q in a very long time and I treated myself to two sticks of the Chicken Yakitori with Green Pepper this morning at Takashimaya. Thumbs up! Incomparably better than the Wadori that I had settled for recently because it was more convenient. 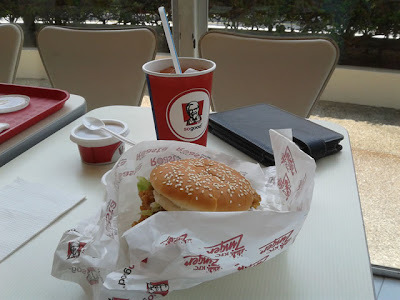 A quick lunch bite at KFC @ East Coast Park. 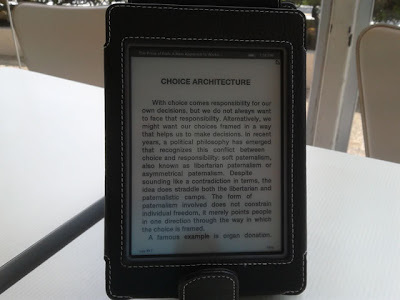 Hardly spent any time with my Kindle. It should have been Tori Q but that is too far away now. 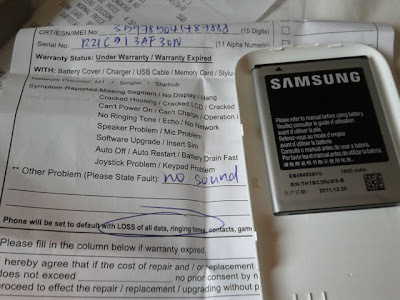 More for the camera and memory than for reading eh? One Galaxy W down. We sent it to Samsung Service Centre at Plaza Sing on Thursday evening. They will need between 3 to 5 days to fix this. It would be Day 5 tomorrow. Singapore's contingent appears at 2:44:30 on this YouTube video of the Summer Olympics opening ceremony in London. The President and First Lady put aside the dignity we are so accustomed to seeing and waved madly at Team Singapore :-) Forget about decorum. Live the moment eh? There isn't time to sit through the whole show. I caught snippets here and there which I thought were the best moments especially Mr. Bean. 2012 London Olympics Opening Ceremony-Mr.Bean from Hao on Vimeo. So which had a better show? Beijing or London? I think they are different. One is a rising power the other tries to carve a niche of its position in the world in post-empire days. Overall we are richer for the diversity, and really you don't want to compete with the Chinese head on. Much wiser to define your own game and thrive in the niches you are best at. Likewise I urge my kids to explore and find their own space and occupy them. This is the imperative for developed societies as the Mediocristan keep giving way to Extremistan. As the school system is not up to this task, we have to somehow search and hew our own path. I pity the families who do not have the educational background and resources to achieve this. I pointed this to my daughter because she hasn't been following this story. I told her, "To hell with the orthodoxy, the Arts Pharisees. Write for the broader society. Offer them the words which they on their own could not find"
Imitate the purpose of the Bible. It was written for us too even if it was ultimately for the Creator. Meanwhile my other daughter is losing her best arts teacher ever. She had clashed with her boss. In this instance the Pharisee won. My guess is that there are bigger Pharisees to please. You can't beat an unholy hierarchy, at least not quickly. Can't be helped. I quote Hri Kumar Nair, the chairman of Bishan-Toa Payoh Town Council. "It had delayed the increase for a s long as possible where expenses would exceed revenue"
I have my doubts. It is so easy for them to pass on the costs to us. I recall when I was living with my parents in Braddell View, we paid less than those living in HDB near equivalents. With the revelation of how misspending could arise from the recent NParks purchase of Brompton Bicycles, we must not take these leaders at their word. I would urge them to prove their case and with enough data for some of us to verify their claim. It would be very interesting to see if Aljunied Town Council would also raise fees, and if they do are their rates better than the PAP managed ones. Just read off AsiaOne that Aljunied Town Council will not be raising fees. Ok, the race is on to see if an Opposition ward can do better than the seven PAP wards.